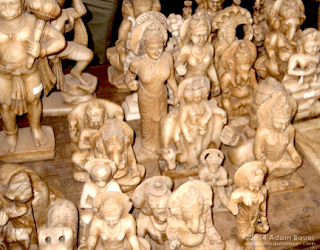 One of the more unusual items I have collected and offered in my Dharma work over recent years has been a constellation of old marble murtis, the temple statuary seen ubiquitously in homes, temples and roadside shrines across India. When properly installed, these murtis are considered literal forms of the divine, and worshipped as a manifestation of the Deity represented—in the above photograph taken near Keshi Ghat in the sacred Yamuna River town of Vrindavan, we see Shiva, Parvati and their son Ganesh with the Yamuna flowing past. Indians often shake their head in genuine wonder when I express interest in a broken temple murti: “Why would anyone be interested in that stone now? God is no longer living there.” But sometimes, one can feel some of the energy of all the devotion that has been invested into that divine stone image, and even though it is missing an arm and has been officially decommissioned and left to spend some years in a sacred river, some of that radiance remains and can be of inspiration to a Westerner like myself. I’ve always taken a firm stand on not supporting desecration of temples or pillaging of sacred items to take them West, so there’s really one basic category of murtis I’ve worked with: statues that have chipped or broken in some way and thus, according to the devotional practices of the area, become unsuitable for worship. Occasionally these statues have had their broken arms or heads crudely re-glued, and often not—it has sometimes taken me many moons of looking at a statue before I suddenly realize—wait, this Goddess only has 3 arms! Murtis like this are a specialty item—I usually don’t buy more than several dozen statues on any trip, I don’t sell too many, and frequently people don’t quite understand them. But for those who feel the vibe, there’s nothing else quite like them.